A suburb probably most famous for its renowned surf beach, Kirra is just minutes from the airport and the larger suburb of Coolangatta. It also offers a great little strip of shops featuring a couple of cafes with views out across the beach and ocean. There’s also walking track along the beachfront which runs from Bilinga at one end through to Coolangatta. Kirra accommodation is located along the beachfront esplanade featuring a mix of older holiday units and new resort-style units with most offering magnificent views across the beach and ocean. Kirra offers a relaxed, laid-back atmosphere and discount accommodation options right by the beach. Public buses can take you from here to almost anywhere on the Gold Coast. Kirra beach extends from Bilinga in the north through to Kirra Point after which it becomes Coolangatta Beach. Kirra Point is popular with surfers and it’s also a great beach for a stroll with nice views in either direction and also for being very peaceful. Please visit Beachsafe for Lifeguard hours and current conditions. You can check Kirra surf conditions and surf cam at Coastalwatch. 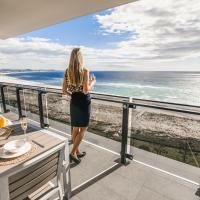 Here is my pick for the best place to stay in Kirra. Tip: rates here drop considerably when booking consecutive nights. Kirra Beach Resort offers superb beach and ocean views with rooms featuring free WiFi, flat-screen TV with cable channels, kitchen facilities, dishwasher etc, washing machine and dryer. Along Musgrave Street, you will find several bus stops for the 700, 760, and 768 buses.